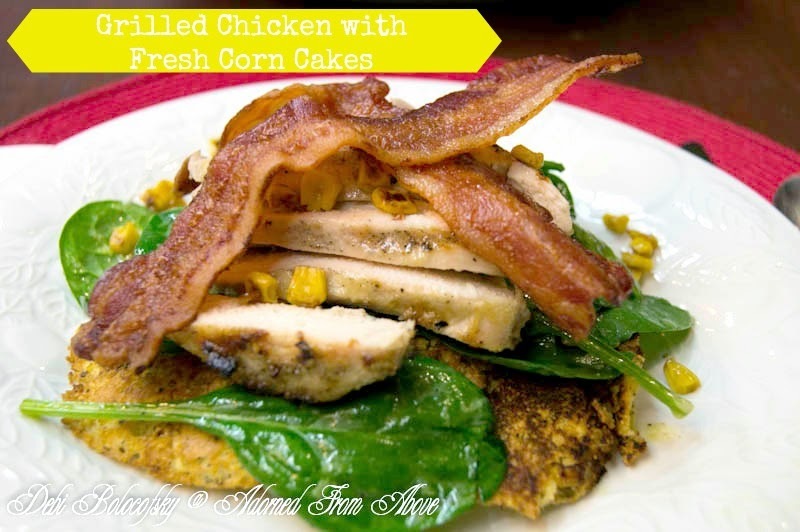 Today I am sharing a recipe for Grilled Chicken with Fresh Corn Cakes from The Southen Living Best Chicken Recipes. This recipe is delicous, and as usual, I don't really follow recipes they are kind of a guideline. So I am sharing my version of this delicious chicken recipe. It has a very lemony flavor, and it is so amazing. I think I may even make it for dinner tonight. Danny and his family are coming over for dinner and his girls eat everything, so I think they will all love this. Next whisk lemon juice, the lemon zest, olive oil, dijon mustard, pepper, and 1 tsp salt together. Set aside 1/4 cup of the lemon mixture for the salad dressing. Put chicken in a gallon size ziploc bag and pour lemon juice mixture over to marinate the chicken, and let marinate for 30 minutes to 1 hour. Next I roasted my corn in a pan on the stove, because I didn't have any fresh corn. I just cooked it until it was browned. If you are using fresh corn, brush it with olive oil and roast it on the grill for 20 minutes. Cook your chicken on the grill for 20 minutes also. Turn it after 10 minutes. So if you are grilling the corn, you can cook the chicken at the same time. Once the chicken is cooked, remove it from the grill and slice it to lay over the salad and corn cakes. If you are grilling your corn, you will cut it off of the cob next. Next you will stir together the cornbread mix and 2/3 cup of water, until smooth. Stir in basil and 1 cup corn kernels. Pour 1/4 cup batter onto a griddle and cook for 3 to 4 minutes, until bubbles form on top and edges look dry. Then flip the corn cakes and finish cooking. Next, toss your lettuce with the 1/4 cup lemon mixture and divide it onto 4 plates. Then put 2 corn cakes on top of the lettuce. Next you will lay the chicken on top of the corn cakes. Then put the bacon on top of chicken and sprinkle the rest of the roasted corn over all of it. This is such an amazing dinner. We love it and hope you do too. This sounds so delicious! 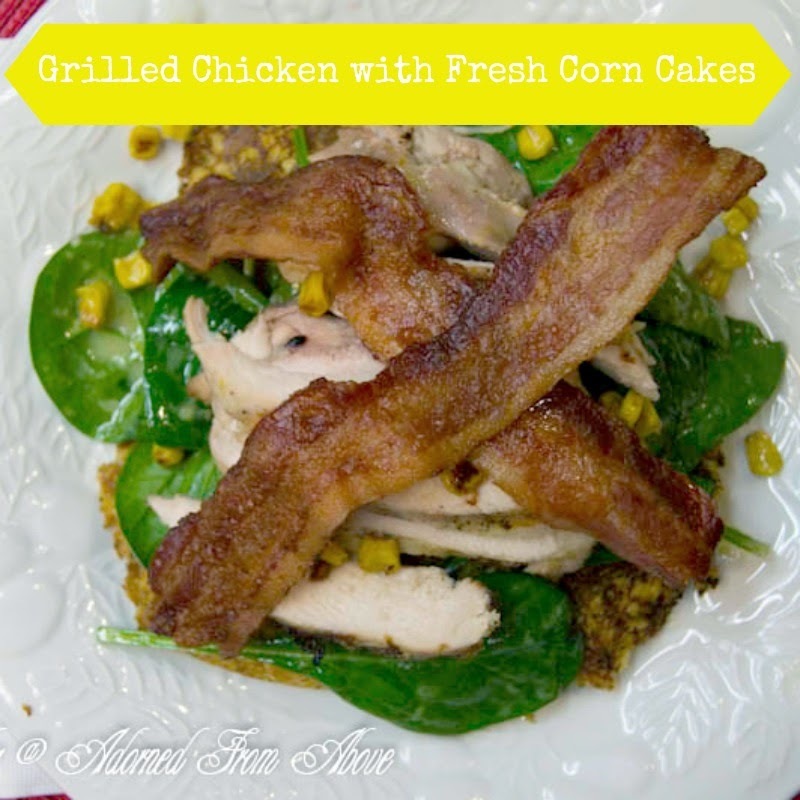 I love grilled chicken thighs and all the seasonings and the corn cakes fit in with how we usually eat. Trying this! Pinned!